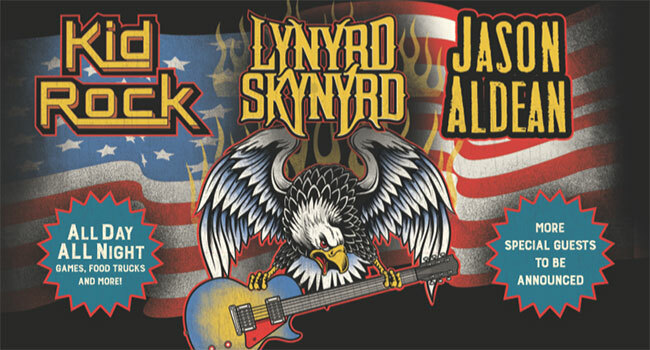 The Jacksonville Jaguars and Bold Events have announced that Lynyrd Skynyrd, Jason Aldean and Kid Rock will co-headline a day of music and fun on Sunday, September 2nd at EverBank Field in Jacksonville, FL. Band members Johnny Van Zant and Rickey Medlocke were on hand for this morning’s press conference held at the Jaguars’ annual State of the Franchise presentation. The concert will be a special homecoming for the band as they return to perform where their legacy began over 40 years ago. The Labor Day weekend appearance will also include more special guests to be announced soon. In addition to performances, the all-day, all-night event will also feature food trucks, games and more. The Rock & Roll Hall of Famers’ final tour, Last of the Street Survivors Farewell Tour, presented by SiriusXM and produced by Live Nation, begins May 4th in West Palm Beach, Fla. at the Coral Sky Amphitheatre. With a catalog of over 60 albums and sales in excess of 30 million worldwide, the band that USA Today called the “whiskey-soaked genre’s most popular and influential crew,” has become a cultural icon that has spanned five decades. Original member Gary Rossington joined by Johnny Van Zant, Rickey Medlocke, Mark “Sparky” Matejka, Michael Cartellone, Keith Christopher, Peter Keys, Dale Krantz Rossington and Carol Chase are ready to rock their hometown of Jacksonville. VIP pre-sale access begins on April 24th. Tickets for the general public go on sale Monday, April 30th at 10 am EST. Additional dates for the farewell tour will be announced soon. Touring consistently since the band took a decade off in 1977, the Last of the Street Survivors Farewell Tour marks a big moment for three generations of fans. The iconic group is widely known for their live performances that usually include their beloved, elongated version of “Free Bird,” most often played at the end of their set, and their live albums including their multi-Platinum certified One More from the Road. In addition to self-proclaimed signature song “Free Bird,” which Rolling Stone said was “easily the most requested live song in existence,” the Southern Rockers are likely best known for the RIAA Platinum-certified “Sweet Home Alabama.” However, with everlasting hits such as “Simple Man,” “Gimme Three Steps,” “What’s Your Name,” “Call Me The Breeze,” “You Got that Right,” and more, it is no wonder Rolling Stone named Lynyrd Skynyrd one of its 100 Greatest Bands of All Time.